On August 7, 1978, President Jimmy Carter declared a state of emergency at Niagara Falls, New York. The emergency was related to toxic materials found near the city’s Love Canal neighborhood. It was the first time federal emergency funds were used for something other than a natural hazard. The toxic waste dump beneath the 99th Street School in the Love Canal community of Niagara Falls, New York, made national news in the late 1970s. 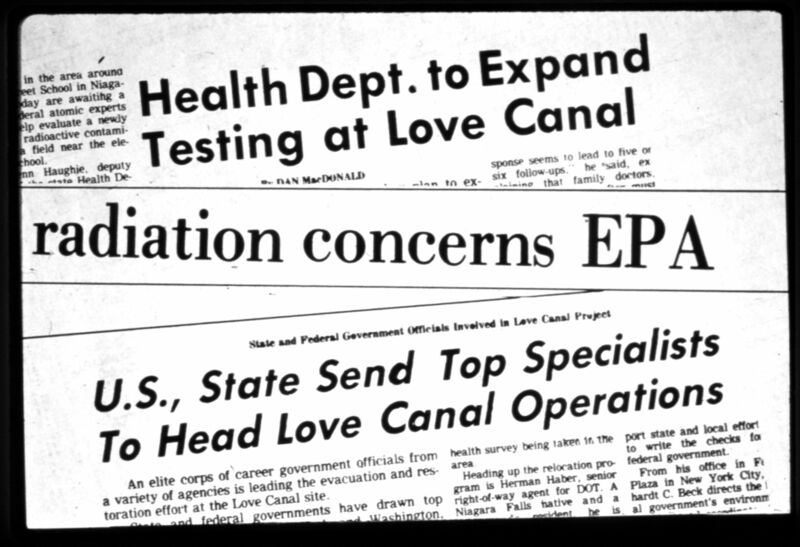 The Environmental Protection Agency (EPA) created the Superfund program, designed to clean up toxic waste sites, in response to the Love Canal situation. The emergency at Love Canal was a result of toxic waste leaking from a decades-old chemical dump site. Local residents and health experts reported an unusual number of illnesses among children born near Love Canal, advised people not to eat food grown locally, and advocated for demolishing a school built on the site. The Love Canal disaster resulted in the relocation of about 800 families and the establishment of the Superfund program, a federal law designed to clean up toxic waste sites. Today, there are more than a thousand Superfund sites across the U.S.
event in the physical environment that is destructive to human activity. chemical compound dangerous to humans and their environment.